The Loggerhead Turtle (Caretta caretta) is known for its reddish-brown, slightly heart-shaped carapace (top shell) and yellow plastron (bottom shell). It is the most abundant species of sea turtle in US coastal waters with major nesting concentrations from North Carolina to South West Florida. It is so well known that in 1988 a fifth grade class from the town of Ninety Six wrote their Senator requesting that the Loggerhead Turtle be the South Carolina state reptile. Later that year, their request was granted as the bill to make the Loggerhead Turtle our official state reptile was passed. 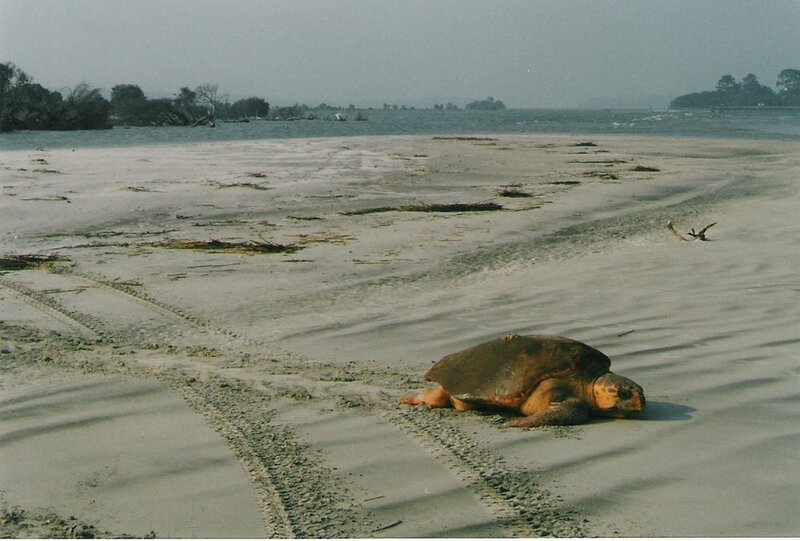 Adult Loggerhead Turtles can be up to 3 feet long and weigh 250 lbs. After reaching sexual maturity around the age of 35, females will lay 3-5 nests over a period of several weeks during each nesting season (May- August). Each nest will have over 100 eggs, each of which will be almost half the size of a jumbo chicken egg. Approximately 60 days later, the hatchlings will emerge from the nest and head straight for the ocean. At this stage in their lives, they are highly threatened by many natural predators, including birds, crabs, fish and raccoons. If the hatchlings succeed in making it to the surf, they will begin what is called a ‘swimming frenzy’ which can last for several days and ensures that the hatchling moves far away from dangerous shore waters where predators are numerous. The time between when a hatchling enters the water and when it returns to coastal areas to forage as a juvenile is called the ‘lost years’ because of how little is known about their behavior at this stage of life. This period can be a decade or more! Adult turtles are mostly carnivorous, enjoying conch, jellyfish, crabs and some fish, but have occasionally been observed eating seaweed and sargassum. Sea turtles have been known to sail through the water at an impressive 15 mph, but are more commonly seen lumbering around coastal reefs. Loggerhead turtles, like all sea turtle species, are threatened by a variety of human activities. The primary threat is incidental capture in commercial fishing equipment, particularly trawl nets used for catching shrimp. NOAA developed a clever device to help sea turtles escape from trawl nets; it is called a Turtle Excluder Device (TED). It is a grid of bars with an opening at the top that is fitted into the trawl. Small animals, like shrimp, pass through the bars and into the net, but larger animals, like turtles and sharks, strike the bars and are ejected through the opening. It is federally required in US waters that trawl nets are fitted with TEDS. Also, if another country wishes to import shrimp to the US, they can only do so if they implement a similar TED program with their shrimp fleet. Other threats include marine debris, environmental contamination, loss of nesting habitat, and artificial lighting. The SCDNR is working on many projects to help better understand and manage sea turtles along our coast. The SCDNR has also partnered with the SC Aquarium Sea Turtle Rescue Program, which acts as a sea turtle hospital for sick and injured animals. This is the only hospital for sea turtles in our state and fills a critical need. Tours of the facility are offered daily for those who would like to meet the current sea turtle patients and learn more about the amazing care that is provided to these endangered creatures. To help sea turtles to thrive in our South Carolina waters and beaches visit the SCDNR website for more information on how to Adopt-A-Nest or purchase an Endangered Species Sea Turtle license plate.